A COLLEAGUE was sitting next to the ­veteran Sunday Times reporter Brian Glanville at the Spurs game against Reading at the end of December when he told him of the grief he felt for a football star who had passed away on Christmas Day. 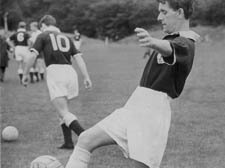 nickname Harmer the Charmer – was a skilful winger for Spurs whose control and passing made him a firm favourite over the 232 games he played for the club. Glanville lamented his death and pondered aloud of how he would have fared against today’s Premiership stars. “What gets me is after his retirement he had to go and work as a messenger in a bank,” the reporter said. FIRST there was Beetlejuice, Batman and years later, Sweeney Todd the demon barber – could the “evil ­editor of the Camden New Journal” be next in line for the Tim Burton treatment? In a recent interview with the US Esquire magazine, the Hollywood director – who lives in Belsize Park with his wife, actress Helena Bonham Carter – revealed it was not scissorhanded young men that haunted his dreams, but this great organ. Personally, I think he is one our most ­talented and original directors and, as a creator of the early Batman blockbusters, someone with a natural feel for popular ­culture. But Burton took time out from promoting his new film Sweeney Todd, based on the Sondheim musical and starring Johnny Depp and Helena Bonham Carter, which arrives here in a fortnight, to lambast the New Journal. “It’s like we’ve got this reputation for being the neighbourhood wierdos... No matter what I do, no matter what I say, I’m branded as the Prince of Darkness,” he told the interviewer. He added: “There was an article that Helena and I were trying to get permission to build a fantasyland in our garden, some kind of amazing gypsy caravan. He was referring to an article that graced this newspaper on August 30 last year. It’s hard to say without a word-for-word account of his interview with the Esquire reporter whether he also referred to his actual planning application to Camden Council. Perhaps, Esquire didn’t think it was important enough. In fact, he and his wife applied for a ‘Shepherd’s Hut’ structure (described by his architect as an “eclectic expression” of the conventional shed), and the picture we used in our news columns last August had been taken from the manufacturer’s catalogue. Nor can I figure why he introduced the ‘homeless’ into the interview. All I can say is that, according to the catalogue, the luxury shed retails at £9,000 upwards – something beyond the purse of the ­average homeless. But what does this matter? Burton is a wonderfully inventive director, and his wife a more than competent actress. ARTIST Milein Cosman has the sort of catholic testes that appeals to me. I knew she had completed portraits of the likes of Henry Moore, Irish Murdoch, Francis Bacon and TS Eliot, but to my surprise I discovered this week she had also executed a stirring picture of the famous Spurs’ player, Jimmy Greaves. Her late husband, the BBC 3 music producer Hans Keller, was an obsessive Spurs fan and introduced her to the great striker. This little gem emerged this week when I met her at the Austrian Cultural Forum in Kensington, where she was the guest of honour. In conjunction with the Jewish Museum the Forum is hosting a retrospective of her works. Unfortunately, there was one portrait missing from the show – that of Jimmy Greaves. I WAS always drawn to the air of certainty and amiable toughness that hung around Roy Shaw who died this week. A handsome man, he was always smartly dressed, and whenever I heard tales about his many amorous adventures, I could understand why women were drawn to him. Whenever we met at the Town Hall we would end up in a quiet spot, reminiscing and chatting about politics. A few years ago he surprised me with a revelation that could have come straight out of a John le Carré spy thriller. Launching into a snapshot of his life, he described how he had worked for army intelligence during the war, and afterwards in Berlin. Later, in the early 1950s, he had worked as advisor for an East-West trade body and, if my memory serves me, also for the left MP Ian Mikardo, who had upset the Establishment by promoting trade with the former Soviet Union. Sometime later, Roy met one of his old mates from army intelligence, who had climbed fairly high in MI5. Curious as to why he had never been honoured with a top gong, his old army chum, with a nod and a wink, referred to his East-West days, and made it clear his card had been marked. Roy, of course, was appointed an OBE, but someone of his stature and service would have expected to be lifted to the Lords. Roy didn’t appear bitter but I caught the note of disappointment in his voice, and thought once again of the treachery of politics.